← Celebrating Bill and Barb Theurer! 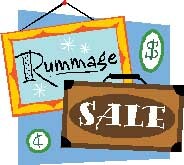 Immanuel will be hosting a Rummage Sale as part of the Community Yard Sale on June 23-25 from 8 a.m. to 3 p.m. Tables are available for rental for $15. Hot dogs, chips, cookies and beverages will also be for sale.